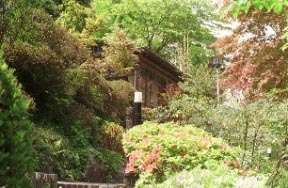 It is dotted so that seven Separate from mains may hide into the grove of a maple or a zelkova at a green thicket.Foundation of the Showa first year and a common store-denominated Separate-from-main guest room have warmth of the peculiar building which took out the drooping tree, and a pure Log.It sits on a traditional veranda, the sound of the clear stream of Tama River is heard, and the four seasons is felt for the trees of a thicket.The inside was heard that many fireflies fly now. Business is done when either Wednesday regular holiday:, or however a tuesday wednesday thursday is a national holiday. 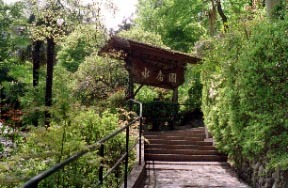 Approach from which it gets down to an inn. They are a dish dependent on a chef, and around ten articles by a season. 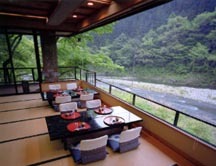 Meal place: It is a hall in a supper, room foods of a Separate from main, and the morning. Breakfast and lunch rest are this restaurant. the difference of a Rates -- a dish -- measure.